(Post by Alex) Here are the first photos from Paris. Syrian President Bashar Assad arriving to Paris with his wife Asma. President Assad with French President Nicolas Sarkozy after first round of talks. 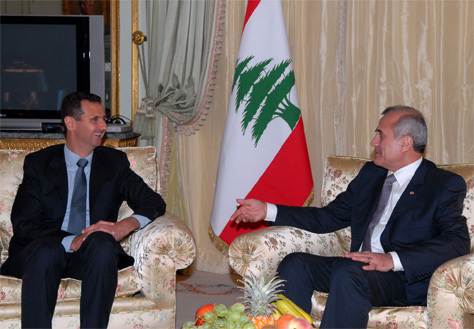 President Assad meeting with Lebanese President Michel Sleiman in Paris. 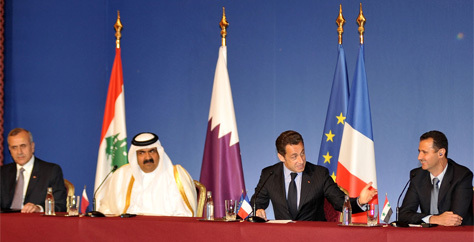 Four-way summit of Syrian President Bashar Assad, French President Nicolas Sarkozy, THe Emir of Qatar, and Lebanese President Michel Sleiman. And for those who believe that the situation in the Middle East goes through cycles, here is a photo from Paris 1998. President Hafez Assad, on a "rare visit" to France, asked the French President to mediate between Syria and Israel, since the United States was only interested at the time in Palestinian Israeli talks. A year later, the Americans got interested again in the Syrian track. Love the first picture and the second cycle. Alex, I appreciate the observation. But, my friend, there really is no need to make a big deal out of it. I mean, if we start saying “Look at Bashar, he can sit next to a Lebanese flag without breaking out into a rash and having smoke shoot out of his ears, etc.” then it makes it seem as if this is a huge step. I mean, for Lebanese — who take their flag and their independence for granted — it is only natural that any foreign leader should be able to sit comfortably near the Lebanese flag. The same thing goes for the embassy. Why should it be such a big deal? As for Shebaa, Syria … unofficially recognized their Lebanese identity. They would have to send a letter to the U.N. to make it official, and that hasn’t happened yet. But believe me I am very happy that Michel Suleiman is our president and that he is an old friend of Syria, and that Bashar al-Asad is ready to open an embassy. I should have posted the first picture only. Absolutely Fantastic and as well put by OFFENDED, Elegant. Speaking of Flags, notice the presence of both French and EU flags begind Nicolas Sarkozy. It may be required as France is a member and the current president of the EU, but it may also signify that EU is also behind Sarkozy’s efforts. The Lebanese flag in the third photo indicates that Bashar was the one visiting Suleiman. Culturally, this is a sign of respect and I am sure it was a calculated diplomatic gesture. It also seems that the French and Syrian presidents are not offended by each others as some may wish. Rather, they seem to be genuinely at ease with each others. I may be reading too much into the pictures, but unfortunately, they, in addition to some scant press releases are our only factual “user guide”, as opposed to punditry, to what is going on. Showcasing that first photo shows how much you guys are suckered by the manufactured image and forgetting what this guy actually is. If real estate prices are a bellwether of political stability, then things are seriously looking up in Lebanon. One of my family members works in real estate, and tells me that prices are skyrocketing in Beirut. Lebanese working in the Gulf are looking to buy investment properties in their childhood neighborhoods of Hamra, Gemmayzeh, Qoreitem, etc. and their childhood villages (Ain Saadeh, Beit Meri, Broumanna, Aley, Baabda, etc.) and are finding that the $300-400K budget they had set aside is simply not going to cut it for the place they thought they could get. Prices are climbing up well over $2000/sq metre for the kinds of properties they are used to living in. In political terms, the embassy is a natural issue and no big deal should be made of it. But from my point of view, the embassy is at least an indication of atonement for past mistakes made by representatives of Syria in Lebanon. It solidifies the notion that Syria recognizes Lebanon’s sovereignty and is willing to deal with Lebanon as an equal member of the world community. This is rather big. I agree with you. So it’s more of a big deal to Syria than to Lebanon then? In the sense that it signals an appropriate shift in Syrian attitudes rather than an appeasement of Lebanese ones? By the way, a few weeks ago Sayyed Hasan Nasrallah declined to release the date of the prisoner swap, saying that if they announced it, the Israelis would change it just to jerk their chain. He said, however, that it would be sometime around July 15, give or take. This was not a casually chosen date. Hizbullah wants to follow the tidal wave of positive media surrounding President Assad’s visit to Paris and the Bastille Day celebrations with a second tidal wave of media surrounding the prisoner swap, so that all the newspapers will be awash with stories of the double-whammy: Asad emerges from diplomatic isolation, Hizbullah emerges victorious over Israel, etc. Pretty good media strategy. These guys definitely own a calendar. Real Estate prices in Lebanon will rise further. Prices in downtown are now actually north of $3,000 per s/m (some are approaching $4,000). I think that they are still cheap. The problem is not the price but the availability of land. Many friends of mine cannot find the land to develop and build on. As a result, prices of existing projects are on a tear. Millions of Lebanese live abroad. Almost all of them would love to have an apartment back home either to retire back to or to spend their summers at. There is simply not enough supply to meet that potential demand. By my count, even at these prices, Lebanon’s real estate prices is about one third of that in Dubai. I would not be surprised to see that gap narrow much further over time. You caught us off guard and you were absolutely right in bringing some reality and perhaps an abrupt end to our “suckerdness” and euphoria. However, I am wondering who is reading too much into the picture. I sure hope that you are not serious about Asma trying to emulate the Indian PM dress in attempt to gain favors?. I guess each of us sees what we want to see. I want to see Syria being for now protected by any means from becoming another Iraq. A year or two ago, I was afraid that the liberators will be bombing my family’s home in Aleppo, that my cousins will be fighting their neighbors how are of different sect, and that my nephews and nieces, or for that matter probably yours, will be forced to join sides of a catastrophic civil war. Call me irrational,selfish, a bleeding heart, or whatever, but at least I am honest expressing my fears, and in expressing a little happiness that someone, even for self preservation, is for now contributing to the preservation of the lives of those I dearly love. I have, long ago, divorced violence as the means to accomplish anything. Even in my writings, i try not to use terms and language of violense. Don’t take me wrong, I, like many Syrians have friends and relatives who suffered political repression. Violence in any shape or form offend my sensibilities and make me rather sad and angry. And I hope, with every fiber of my being, that Syria, one day, and hopefully today before tomorrow, enjoys the political freedoms I do enjoy in my “Ghorbeh”. In fact, I suffer from guilt syndrome for not being able to do much about it. But I am not cut to be an activist. One last point, please correct me if I am wrong, Is she an shameless agent of the regime because she is a sunni who married an alawite, i sure hope this is not what you are trying to imply. You got my point rather well. This is exactly what I wanted it to mean and the word “Appropriate” is the operative word here. I hope it is true and real. That’s true about downtown (Saifi, etc). Actually some of the luxury properties on the Corniche are up near $5000-6000/sq metre. Are ex-patriots, who live in Lebanon few weeks a year making it harder for their country folks to buy homes in the country they live in 365 days/year. There is something wrong with that picture!. I understand the love one have for her/his home of origin, but making life harder than it already is for your people is a strange way of demonstrating that love, and it is even more strange if you are buying investment property. OFF THE WALL, “shameless agent” is nothing to do with her tribal affiliation. She is allegedly well educated and western-reared and exposed to alternative realities. She clearly has two separate brains (or none at all) to be able to strut around in that idiotic charade she does of being a compassionate do-gooder and charming “representative” of that regime. I don’t disagree with you about the benefits of current stability, but just imagine the benefits of a few years of non-brain dead gun-free leadership! Thanks for your clarification. I am glad that tribal considerations is not a motivating factor in your eagerness for political reforms in Syria. You definitely got my attention talking about gun-free anything. I would love to see a gun-free leadership. On the brain-dead issue, I am not so sure that is an accurate description. Recent events, for now at least, attest to the Syrian leadership’s capacity for navigating very treacherous waters. May be it is self preservation, but they have done it well (not necessarily righteously). I think that they were capable of capitalizing on the mistakes of others quite ably. What is that if not political skills?. I am one of those who are reasonably optimistic that this time we will break the cycle and move decidedly forward … towards a final peace settlement. As for Brain-dead … parts of the regime might be … but there is enough brains in the regime. I disagree with you. والحقيقة نحن نرى مهارة سورية لا يستهان بها، فدمشق عمليا اخترعت الأزمات وقدمت حلولا لها. تجد بصماتها في بيروت والدوحة وغزة. فشريكها حزب الله احتل بيروت الغربية لتتدخل لإيقافه. ويرفض رفاقها من المعارضة اللبنانيه انتخاب ميشيل سليمان، رغم انه مقبول كمرشح للرئاسة، لتتدخل فيوافقوا عليه في حفل الدوحة، الذي كان هو الآخر من اختراعها. وفي غزة ترفع رفيقتها حماس درجة العنف ضد اسرائيل لتوعز لرفيقتها حماس بايقافها. واختتمت بالايعاز لرفاقها في المعارضة اللبنانية، مرة ثانية، لانهاء تعطيل تشكيل الحكومة البنانية، لتعلن فقط قبل يومين من رحلة باريس. I was joking ya zalameh! … ya3ni would I really write to express my pride in Bashar’s ability to sit next to a Lebanese flag?! ٍSorry ya habibi Alex; I’m a bit slow today. I then took a new fresh look at the picture. Sorry to tell you, not much changed. The “handshake roulette” between Prime Minister Ehud Olmert and Syrian President Bashar Assad, which has been keeping the Union for the Mediterranean and the Middle East preoccupied for weeks, will stop today. But even if a Syrian handshake does take place with an Israeli lame duck, or cooked goose, it will produce no thrill. French President Nicolas Sarkozy has been working on the real thrill for almost two months: bringing Assad back into the international fold and replacing the U.S. president as the intermediary in the peace process. Now that a Lebanese government has been formed, Assad and Sarkozy will be free to discuss the peace process with Israel, the international trial of the suspects in the 2005 assassination of former Lebanese prime minister Rafik Hariri, and advancing the Israel-Palestinian negotiations. It’s a two-way deal: Assad will push the peace process with Israel and Sarkozy promises to make a state visit to Damascus in September or October. Assad will see to the functioning of the Lebanese government and open an embassy in Lebanon, and Sarkozy will send a delegation of high-level business people and legislators to Syria in August. A deal to sell Airbus planes to Syria is also in the offing. American sanctions on Syria are clearly breaking down. Turkish Prime Minister Recep Tayyip Erdogan made a last-minute decision to come to the conference, despite concerns that the Union for the Mediterranean will leave his country at sea, far from the warm shores of the EU. Turkey, also an intermediary in the Syrian-Israeli process, will push in two directions at the conference: toward direct talks, and bringing in Washington as a partner. A Turkish source told Haaretz Saturday that he did not discount the presence of an American representative at the coming round of talks. “The Americans must accept that we are part of the solution not only in Lebanon but also in Iraq and Palestine,” Assad told Le Monde diplomatique. The Americans apparently realize that if they don’t hurry, Sarkozy will take the whole pot. According to Arab press reports, Egyptian President Hosni Mubarak, the conference’s co-chairman, has invited Assad to dinner. Yes, this inter-Arab conflict must also be solved if Egypt wants to advance negotiations between Israel and Hamas. So must the bad blood between Saudi Arabia and Syria, after the Hariri assassination in 2005 and Assad’s calling the Saudis “half men” for not sufficiently supporting Hezbollah in the Lebanon war. And Mubarak and Saudi King Abdullah are not on speaking terms. If feathers can be smoothed over dinner, Assad can receive Arab approval and Sarkozy can chalk up another success in the face of American feebleness. aren’t they ashamed speaking lebanese dialect in a news report? well..Im not surprised by LBC since that time i saw a wahhabi show on this belly dancing channel. A Syrian embassy in Beirut: The Return of the Mokhabarat from the large door with the benediction of Sarkozy. Would they reopen the offices in Ramlet el Baida? It guess for the viscerally anti-syrian lebanese, it will be hard to swallow. Get ready for a flow of critics and accusations of spying and plotting. The embassy may be a double edge sword. so… the LBC doesn’t put a microphone in front of Bashar Assad’s face and interview him too? or did we just not see that part? for now, syria should avoid regional and international tension, maintain feverable terms with Europe and focus on economical growth. poor economy limits syrias maneuvering abilities. with good and healthy economy and established relations with lebanon , syria could go back to lebanon economically , and guess what? lenanese would be happy about it, because its mutually beneficial. don’t forget that syria will always have influence on its neighbors.it just needs money to move things on the ground. so why not opening an embassy in lebanon? lets play the game smart and do our business legitimately. 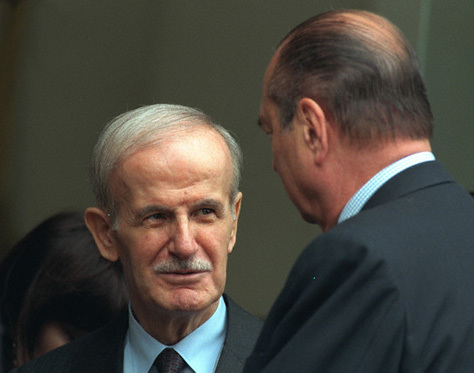 I found a nice link from 1998 that went with President HAFEZ Assad’s “rare visit” to France. Does it sound similar to today’s headlines? PARIS (AP) _ Syrian President Hafez Assad arrived in France today for a rare Western visit that could mean a higher profile for Europe in the Middle East peace process, and for Syria on the world stage. Assad’s visit _ his first here in 22 years _ also aims to pull Syria out of its diplomatic and economic isolation. It comes two months after Damascus began negotiations for an accord with the European Union designed to improve trade and other ties. I feel optimistic about the future. The threat of war seems to have lessened. All this will be good for greater freedom in Syria too since the regime will feel less threatened. Of course, it still has the ihwan to deal with; but why could they not be included in the picture ? I agree with you dear Annie. The Ikhwan are deep rooted in the syrian people but many of those who share their ideology will vote for liberal parties.It will be good to see in Syria a syrian version of the AKP of Turkey and Morroco or Kifaya of Egypt or the Malaysian model,the union of liberals and conservative muslims. But the game of Bashar is to show to the world and this is what that he tries to explain in every interview,that the syrian people are barbarians , dangerous extremists and qaida lovers. I tend to agree with you. Although I am not “committed/Ortho-practic” Muslim, I don’t see much value in a government that does mirror its people. Turkey’s status in the world and even its economy have improved since the Islamists took charge. Only when you exclude them out you radicalize them. I am not that worried about my personal freedoms if the Islamists ascend to power, Power brings reason, and the radical elements would take a backseat. Conservative Syria is “the nation”, all what we need is a pact with them to secure our personal freedoms. I have no doubt that they are more than willing. Conservative Syria is not the Taliban. It’s Industrial, pro-business, pro-family, and educated. It’s more diverse that many would like to admit. If I was in Bashar shoes, I would let them be and would be a guarantor of that pact through maybe a higher council or something. The statuesque will just prolong our tardiness among nations. What you are saying is not fair. Bashar brought up the subject of extremism twice: 1- when he’s asked about the political prisoners, he explains that they are in jail for extremism charges. 2- when he talks about the fallout of Iraq war and the lack of peace in the region, he explains that both problems had caused a surge to extremism in the region. He didn’t say that Syrian people are barbarians. But extremism is potentially serious problem in Syria. It’s not a fallacy. Give the guy some credit. Where would you advise to buy in Beirut? there is always a risk of renewed violence but i guess there is a risk in all investments. Offended ,the dangerous extremists are never more than 1 % in any muslim country in the world even Pakistan who was ruled by a military regime for some years returned to a some level of democracy.But go understand why Shaker al Absi was freed despite he was wanted by Jordan for terrorism charges or Mahmud Aghasi Abu al Qaaqa was killed by the mukhabarat after he was rewarded the post of general director of islamic schools in Aleppo,these stories are related to the dirty syrian mukhabarati game but before that they kidnapped and tortured to death the great sheikh of the naqshbandiya al Khaznawi,this regime doesnt care about extremist or not extremist.. most of the prisoners in the syrian prisons whatever they are islamists or seculars;belong to the educated class.Bashar who belong to a familly of criminal mafioso ,should not be allowed to teach us what is right and what is wrong. Offended,as free thinker ,you are a potential prisoner in your beloved syria al asad wal mahabeh ,this regime has transformed your Aleppo to Nawarestan,the aleppine elite has disappeared ,this is of course if you want to be a true free thinker and not a true hypocrit.What i hope for you is that you speak your opinion without fear in Syria. Thank you for the reality check. Bashar and his accomplice- accessory wife may well prance in France, but who or what are they really representing? And by what means do they acquire and sustain their self-appointed status? And at what cost to others? They are a sinister symbol of how wrong things have gone for all the millions of Syrians who live in a disastrously run country without opportunity, choked with corruption and petty bureaucracy with thugs in the shadows. Study the photograph heading this page and it hits you: they are too stupid and criminalised to be embarrassed or feel a sense of responsibility about anything. The more expensive areas will be best to buy if one can afford them. I personally love the downtown area. But, as QN said, it has already shot up. During the HA and Israel confrontation, luxury apartments were selling for $1800 per sq meter. The same now goes for close to $3500. Many people are still not comfortable with the fact that HA is still armed. This leaves a big cloud over the future of the country. But, this is exactly why the prices are yet to reach Dubai levels. Were you to remove that issue as well as the others (may you cannot ever do that in Lebanon), prices will be substantially higher. You are absolutely right. The Aleppo elite of old has disappeared. They did that when they overlooked the fact that once they lost the army, they would also lose their influence in the country. While they sent their sons and daughter to study at the French Sorbonne and other fine institutions, others were slogging it out at the army. The rest is history. The so-called elites cannot blame anyone but themselves. Did they have a God-given right to rule the country till eternity without making the sacrifices? I don’t think so. Others did. They knew that the only way to their Nirvana is to take control of that institution and never let go. This is precisely what took place. Had it been you, you would do the same. Instead of complaining from a computer keyboard, please keep in mind that it is sacrifice, brutality, long term planning and the willingness to die that wins you the highest political office in this region. The old elites (and the new ones) were/are not willing to do that. They want political participation on the cheap. Yeah, and it’s working wonders for the “winners” in Zimbabwe and North Korea too. I am not sure about the Assads’ “sacrifice and willingness to die.” Make that selfishness and willingness to kill. You convey an image of justified losers (against a primitive dictatorship) being some soft “elite” who didn’t have the guts and awareness to play dirty and nasty enough and join and beat the guys with guns. I think I know what you’re trying to say, but life and history was never so simple – or maybe much simpler. I think that photo of Mrs Assad wearing the Indian PM’s dress has bewitched you. Don’t you all forget that Bashar is truely popular and that so is his wife? 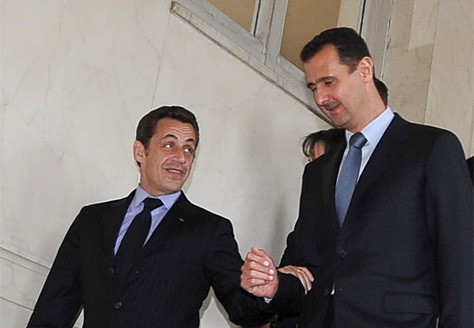 From a purely image point of view I would rather be represented by the Assad’s than by the Sarkozy’s. Don’t worry, Asma al Assad will go shopping in Paris for more adequat clothing. She is so elegant anyway that she will not have hard time making you forget the indian PM outfit. Just 39 percent of U.S. Jews report that religion is important in their daily lives, well below the overall national average. Among this smaller group of religious Jews, however, Obama and McCain break even, 45 percent to 45 percent. This compares to Obama’s 68 percent to 26 percent lead among the majority of Jews for whom religion is not important. 3) Priorities … As long as the Middle East is a playground full of exciting non-stop events, I am more interested in the skills and performance of Syria’s president at the regional level. At the time when Iraq and Lebanon were going through challenging sectarian and religious conflicts … at the time when the Saudis are paranoid about Shia Iran … I can not even start to think about what would have happened to the Middle East (Syria specifically) if we were governed by the iKhwan instead. Would they have opened the doors of Syria to the Shia Iraqi refugees for example? … would they have remained neutral without taking sides (fighting?) with Sunni Iraq against Shia Iraq? … What would have happened to Lebanon when Hizbolah (Backed by Iran) refused to allow total Saudi “influence” to rule Lebanon after Syria withdrew its army and after the Bush administration made it clear it wants Lebanon to be Saudi Arabia’s summer resort? … How would the Seniora-supporting iKhwan leaders of Syria deal with Shia Hizbollah and with Lebanon’s Shia population? “the Assads” proved that they are uniquely skilled at reading the region. The rest allow their religious, sectarian and personal ego factors to influence the way they read the region. And as Annie sad … you are forgetting that Bashar is actually very popular in Syria. And you are forgetting that Bashar is also very popular in the Arab world (Zogby poll, remember?) … second most popular leader after Nasrallah. Having said that. If we have a peace settlement with Israel, good relations with the United States (and their Saudi puppets) … I would switch my priorities to reforming Syria’s economy and political system “sufficiently” … gradually, noticeably, without rocking the boat. Let’s wait and see … few years, not a 100 years. يكفي لدراسة محطة «العربية» وتقييمها أن تشاهد البرنامج «الخاص» الذي أعدّته جيزيل خوري في برنامجها «باللبناني» عن المناضلة دلال المغربي. يكفي أن تتبيّن خبث الدعاية السياسيّة على برامج المحطّة. أظهرت جيزيل في بداية البرنامج صورة لإيهود باراك (قاتل القادة الفلسطينيّين والشاعر كمال ناصر في أسرّتهم في نيسان 1973 بمساعدة من لبنانيّين، محبّين مبكّرين للحياة) مع جثّة دلال المغربي، وقالت إنه كان «يعاين الجثة». «يعاين الجثّة»؟ هل حوّلت جيزيل خوري إيهود باراك إلى طبيب شرعي؟ لم تودّ أن تذكر أن باراك مثّل بالجثة ونزع عن دلال المغربي قميصَها العسكري وتركَها مكشوفةً (بهدف إذلال من لا يمكن إذلالها حيّة أو ميتة)، عرضةً لعدسات المصوّرين الإسرائيليّين في دولة لم تعترف يوماً باتفاق جنيف. وقالت خوري إن والدة دلال لم تعنِ لها قضيّة فلسطين شيئاً لأنّها…لبنانيّة، وحرصت كاميرا «العربية» على إظهار صورة لرفيق الحريري أثناء المقابلة مع أم دلال. وزادت خوري إهانات أخرى، محمّلةً دلال المغربي ورفاقها مسؤوليّة اجتياح إسرائيل لجنوب لبنان في 1978. ولم تجد خوري أفضل من سعود المولى (الفتحاوي السابق والدحلاني الحالي) اليساري السابق المُولج من جانب إبراهيم شمس الدين (المُستوزِر الحريري) بإعادة إنتاج لمحمد مهدي شمس الدين، الذي هادن حكم أمين الجميل الإسرائيلي حتى أثناء مفاوضات 17 أيار المشؤومة. سألت المولى عن جدوى تلك العمليّات الفدائيّة، وأجاب معتذراً بأنه لم يكن قد اكتشف حب الكيان ــــ المسخ آنذاك. هذا نموذج فقط لنوع الدعاية التي تطغى على شاشات آل الحريري وآل سعود، وعلى محطة «العربية» بصورة خاصة. هذا ما فعلوه بدلال المغربي في ذكراها. كم غيّروا في العناوين السياسيّة لمسخ الوطن: من ثورة رمزها دلال المغربي إلى ثورة رمزها نايلة معوّض. لكم ثورتكم، ولي ثورتي, بالإذن من جبران خليل جبران. مساحة التعبير تضيق باستمرار، وإصلاح ذات البين المشؤوم بين آل سعود وآل ثاني ضيّق ما بقي من المساحة. عليكم بالإنترنت، وخصوصاً أن الجامعة العربية والكونغرس الأميركي باشرا نقل معركتهما ضد ما يسميه بوش «الإرهاب» إلى الإعلام العربي. والإعلام العربي هو الوجه الآخر للحروب الأميركيّة التي لا تنتهي. وعندما تقرأ عن المليارات التي أُنفقت على حروب أميركا الدائمة (انتقلنا من دعوة تروتسكي للثورة الدائمة إلى عصر الحروب الأميركية الدائمة)، تعلم أن مليارات قد أُنفقت أيضاً على الدعاية المّوجّهة نحو العرب والمسلمين. والتناغم بين الدعاية الأميركية (الفظّة) والدعاية السعودية ــــ الحريرية ظاهر للعيان. أكّدها عَرَضاً الصحافي نديم قطيش بعد انتقاله السهل من محطة «الحرة» إلى محطة «أخبار المستقبل» (المتخصّصة بأخبار آل سعود وآل الحريري). فقد قال رداً على سؤال في برنامج «ترانزيت» على محطة آل الحريري إنه لم يجد أي فرق بين محطة «الحرة» ومحطة «المستقبل». لم يلاحظ ما قاله. ابتسم وانتقل الحديث إلى موضوع آخر. والدعاية الأميركية تهدف إلى نحو ما تهدف إليه القنابل والصواريخ الموجّهة: فهي تبغي تطويع الرأي العام العربي والإسلامي لكي تطيب للولايات المتحدة احتلالاتها في طول المنطقة وعرضها. وقد تأسّس تلفزيون «الحرة» عام 2003، العام نفسه الذي تأسست فيه محطة «العربية». قل إنها الصدفة، أو قل إنها نظرية «صاءبتْ» السائدة في 14 آذار. تسألهم عن التناغم والتماشي بين خطابهم والخطاب الأميركي ــــ الإسرائيلي فيردّون عليك بنظرية «صاءبتْ». نظرية جديدة في العلاقات الدولية يبرع في شرحها خبراء العلاقات الدولية في أمسيات تيار الحريري، مثل عقاب صقر ومحمد سلام، الذي نذكره من أيام أمين الجميل السوداء. وتأسيس «الحرة» و«العربية» تزامن ــــ يا للصدفة ــــ مع الاجتياح الأميركي للعراق. كانت تلك الفرصة الذهبيّة لآل سعود. لم تكن المملكة لتطيق أن تعاني تصدّعاً في علاقاتها مع الدولة ــــ الإمبراطوريّة الراعية لها منذ تقاعد الإمبراطورية البريطانيّة (يجب أن يُترجم كتاب بوب فتاليس الجديد عن «مملكة أميركا»، وهو يتضمّن شرحاً وافياً لتغلغل أميركا المبكّر في نظام المملكة السعوديّة واقتصادها). والملك فهد عرف مبكّراً (من زمن حكم الملك خالد الذي لم ينصرف إلى شؤون الحكم لانشغاله بالتُّقى والورع، مما ساعد في صعود السديريّين السبعة) كيف يدير علاقاته، الذليلة طبعاً، مع أميركا. عرف أن ما فعله شقيقه فيصل (إنشاء أحلاف إسلامية رجعيّة حول العالم لمحاربة الشيوعية وعبد الناصر) لم يكن كافياً. سخّر فهد (الذي لا يزال الزميل رضوان السيد يبكيه بحرقة على الشاشات السعودية، لكن دموعه صادقة في تعبيرها ولعله يتعزّى بصعود إمارة عزّوز الواعدة) كل إمكانات المملكة لدعم أعمال الإمبراطورية الأميركية السريّة (والقذرة كما يسمونها هنا) وتمويلها حول العالم. المملكة التي تزعم الحياد وتزعم «المسافة المتساوية» بين أطراف النزاع، لم تترك نظاماً يسارياً أو اشتراكياً حول العالم لم تتآمر عليه، ولم تترك نظاماً يمينيّاً رجعياً لم تمدّه بالدعم، وإن كانت داعمة بجدّ لـ«يساريّة» اليساري السابق الياس… زهرا. اهتزت العلاقة بين أميركا والسعودية بعد 11 أيلول، وسارعت المملكة إلى إصلاح ما تضرّر. وضعت خطة محكمة، وأدركت أن المطلوب منها أكثر من دعم سرّي خجول للمشروع الإسرائيلي. كان على الملك عبد الله إثبات ولائه للأميركيّين، وخصوصاً أنه لم يكن محلّ ثقة عند الأميركيّين الذين فضّلوا الملك فهد وأشقاءه. عانى عبد الله من سمعة قومية عربيّة (كلاميّة ليس إلا)، كما أن كتاب بوب وودورد عن حرب الخليج الأولى روى تفاصيل زيارة وزير الدفاع الأميركي للمملكة آنذاك، ديك تشيني، وكيف همس الملك عبد الله في أذن الملك فهد آنذاك أن القوات الأميركية لن تترك أرض الحجاز إذا وطئتها. لم يعلم الملك أن عضواً في الوفد الأميركي كان يلمّ بالعربية، وفق رواية وودورد. سارع عبد الله، ملكاً، إلى تبنّي مبادرة توماس فريدمان كما هي، ومن دون الإشارة إلى حق العودة (ويضيف مروان المعشر في كتابه الذي صدر أخيراً عن «الاعتدال العربي» ــــ أو صراط عبد الستار أبو ريشا ــــ الذي تروّج له كل وسائل الإعلام الموالي لإسرائيل في أميركا، أنه تدخّل لتعديل الصيغة المتعلّقة بحق العودة حتى يتسنّى لإسرائيل حق الموافقة والرفض. هنا نعلم لماذا اختاره بول وولفويتز عوناً دعائيّاً له في البنك الدولي). هرع الملك السعودي مذعوراً لإرضاء أميركا، وساعده في ذلك الأمير بندر الذي رفض أن يتخلّى عن ملف العلاقات الأميركية ــــ السعودية حتى بعد تعيين صهره، الأمير تركي (الصديق والراعي «السابق» لأسامة بن لادن قبل أن يكتشف هو الآخر حبّ الحياة بعد 11 أيلول) سفيراً للمملكة في واشنطن. وأدّى تدخل بندر السافر والخفي في واشنطن إلى استقالة مفاجئة لتركي. وتطلّبت عودة العلاقات الأميركية ــــ السعودية إلى سابق عهدها من الصفاء والتآمر المشترك أداء السعودية خدمات جلّى في مجال الدعاية المرافقة للحروب الأميركية، ما يُسمى «العمليات النفسية» في مصطلحات وزارة الدفاع الأميركية. ولا ندري الظروف التي أحاطت بولادة محطة «العربية»: لم يُعلن عن المالك إلا بعد مرور بضع سنوات من الانطلاق. نعلم اليوم أن صهر الملك فهد هو المالك، وقد دعا أمين الجميل إلى حفل عيد التأسيس في السنة الماضية، وأشاد الأخير بالمحطة، منوهاً بخدماتها «للقضية العربية». أي إن محطة «العربية» تخدم القضيّة العربية، وفق رؤية حزب الياس ربابي، الذي كان يتلقّى أموال الدعم الإسرائيلي منذ الخمسينيات. و«العربية» واضحة في توجّهاتها وسافرة في تحريضها ومجاهرة في ولائها ومباشرة في دعايتها. لا تحاول الإبهام أو التستّر، وإن استسهلت استعمال كلمة موضوعية في أحاديث مع مسؤولي المحطة بالإنكليزية. لا يستطيعون إمرار عبارة الموضوعية باللغة العربية مع مشاهدين ومشاهدات يألفونهم. ففي الموضوع العراقي، تضيع المحطة في التغطية بين «المواد الإعلانية» المُروِّجة للاحتلال (والتي يعمد تلفزيون «الجديد» إلى بثّها بنشاط أخيراً)، حتى باتت «التقارير الصحافيّة من مراسليها في العراق لا تختلف البتّة عن المواد الإعلانية ذات الأسلوب الدعائي المألوف في إعلام كوريا الشمالية. والمواد الإعلانيّة مجهولة المصدر وإن أعلنت عن أسماء وهميّة من نوع «مواطنون عراقيون» أو «مزارعون» أو غيرهم من الأسماء التي توحي بأيادٍ خفيّة. وقد ذكر لي الإعلامي الأميركي الذي يدير شبكة «لينك» أن وليد معلوف (وهو على يمين المحافظين الجدد في الإدارة الأميركية وإن احتلّ موقعاً هامشيّاً، وهو قد حلّ ضيفاً مكرّماً على رئيس لبنان الجديد قبل أسابيع فقط في قصر بعبدا، لكن لبنان مضياف لمتعصّبي الغرب الصهيونيّين) هو الذي يسوّق لتلك المواد في وسائل الإعلام العربي. أما مراسلو المحطة في العراق فهم يذكّرونك بصحافيّي صدام: في النبرة الخطابية وفي التقارير التي تتضمّن إدانات للمخربين والإرهابيّين. (وتعريف الإرهاب والتخريب في الإعلام العربي يخضع لمعايير وزارة الخارجية الإسرائيليّة. هي تقرّر، وهم يكرّرون). لعبت المحطة دوراً بارز الأهمية في رفع الحرم عن تسعير الخطاب السنّي ـــــ الشيعي. وهذا التسعير لم يتوقف من لدن المملكة الوهابية على امتداد العقود (يحاول الكاتب الليبرالي الزعم، شاكر النابلسي ـــــ مؤلف كتاب بريء في موهبة خالد الفيصل الشعرية ـــــ أن يعيد كتابة تاريخ آل سعود عبر تصويرهم كأعداء للوهابية، ومتصدّقين (فقط) على الإخوان المسلمين)، وقد كرّست له الكاتب الباكستاني إحسان ظهير الذي لم يتوقف لسنوات عن إنتاج غزير لكراهية مذهبية حادّة سبقت خطاب المفتي الجوزو الذي استقال على ما يبدو من خليّة حمد. وخطة تسعير الصراع كانت أميركية الدوافع والإخراج والمقاصد: أرادت الولايات المتحدة أن تحدّ من الطموحات الإيرانيّة في المنطقة، كما أنها أرادت أن تدفع بطرفي الصراع المذهبي في العراق إلى الخوف المتبادل، مما يُسبغ شرعيّة على الاحتلال ويطيل أمده. والخطة، بالإضافة إلى تلبيتها مطلباً أميركياً ــــ والطلبات الأميركية لا تُردّ لدى سلالات النفط ــــ توخت توسيع شعبية الحكم الجائر في المنطقة العربية ومشروعيته. وضع الملك الأردني اللبنة الأولى، ثم تولى الملك السعودي متابعة المهمّة بنشاط. محطة «العربية»، ومحطات أخرى مثل وسائل إعلام الحريري، اضطلعت بالمهمة متحمسة، وإن أظهر استطلاع للرأي في العالم العربي أجراه فريق في جامعة مريلاند ونُشر أخيراً، أن تسعير الخطاب المذهبي لم يؤدّ إلى مبتغاه، باستثناء محيط سنّة لبنان. أما في أوساط سنّة المنطقة، فشعبية حزب الله لا تزال تفوق شعبيّة ملوك شخبوط. واستعانت محطة «العربية» بفريق من إعلاميّي اليمين اللبناني، وكان إيلي ناكوزي وجيزيل خوري نجمَيْ محطة افتقرت منذ تأسيسها إلى عنصر النجوميّة الذي يساعد محطة «الجزيرة». وإيلي ناكوزي وفّق بين دوره في المحطة وبين ادارته (شبه) الرسميّة لحملات اياد علاوي الانتخابية. وجيزيل خوري انهمكت بفعل ما تستطيع للترويج للقوات اللبنانية ولأبي فادي دحلان. ولا تحاول محطة «العربية» ادّعاء الحياد أو الموضوعيّة، فهي فوق الحياد وتحت سقف العائلة المالكة. فضيوف مكتب الدعاية الأميركية يُستقبلون في كرسي ملاصق لكرسي المذيع (والمذيعة) وهذا شرف لا يحظى به سائر الضيوف، كما أن المسؤولين الكبار في الإدارة الأميركيّة يظهرون على المحطة أكثر مما يظهرون على محطة «فوكس نيوز» اليمينيّة. واستضافة «العربية» الضيف الأميركي (والإسرائيلي) باتت مضرب الأمثال بلطفها وتهذيبها وغياب المساءلة. لا يحتاج الضيف الأميركي للتحضير هنا. وعندما حلّ بوش ضيفاً على إيلي ناكوزي، ظهر الأخير كمن يقابل نجماً سينمائياً، فاغراً فاه. سأله عن هذا الإجحاف الشديد في عدم محبة العرب والمسلمين له. كاد ناكوزي أن يضرب الطاولة بيده احتجاجاً على وقاحة جماهير العرب. وعندما تمرّ حاملة طائرات أو أسطول في المنطقة، يأتي القائد العسكري الأميركي إلى استديو المحطّة ليتحدث مدة ساعة أو أقل عن النيّات السلميّة للقوّات الأميركيّة. وتجلّى دور المحطة في الموضوعَيْن اللبناني والعراقي بصورة خاصة. أما في الموضوع الفلسطيني فالمحطة (التي مثلها مثل محطة «الجزيرة» قرّرت الضرب بالمقاطعة العربية ضد إسرائيل عرض الحائط. ألم يقل جلال الطالباني أخيراً عندما صافح إيهود باراك في أثينا إنه فعل ذلك من باب «الحضارة»؟). تستضيف أبواق الصهيونيّة الذين يأتون إلى المحطتين مكرّمين معزّزين (على الأقل، هم يتعرّضون إلى مساءلة تزعجهم على محطة «الجزيرة»). لا أدري لماذا يشعر العربي الليبرالي بالحضاريّة عندما يدعو إلى سلم مع إسرائيل، أو عندما يكنّ إعجاباً لتل أبيب، كما فعل بلال خبيز. وفي الموضوع اللبناني، تستعين المحطة بفريق كامل الجهوزيّة الدعائيّة من 14 آذار، وهي تسمح لوجهتيْ نظر: أي يمكن وجهة نظر أكرم شهيّب أن تتصاحب مع وجهة نظر فارس سعيد. هذا هو التوازن وتعدّد الآراء في الإعلام السعودي، الذي يسمح لأكثر من شخص في الفقرة الواحدة بإغداق المديح للملك السعودي. والتغطية اللبنانيّة هي مثلها مثل كل التغطية العربيّة للمحطة: تأتي من منظار رصد «المخطّط الفارسي» للمنطقة. فلا يرد تقرير من دون استغلاله ضد «المخطّط الفارسي». ولا يرد تقرير إلاّ يتضمّن الترويج للمخطط الأميركي ــــ الإسرائيلي، ومع إنكار وجود هذا المخطّط في الوقت نفسه. ويرسم القيّمون على محطة «العربية» خطّاً واضحاً في موضوع العراق وأفغانستان. والهدف لا لبسَ فيه. فلا احتلال أميركياً في أفغانستان ولا احتلال أميركياً في العراق. هناك قوات «تحالف» مكلّفة القيام بمهمّة إنسانيّة من جانب «المجتمع الدولي» (المصطلح الجديد للدور الصهيوني حول العالم) لحفظ الأمن والسلام في الدولتيْن. وكان واضحاً أن الإعلام السعودي يكيّف نفسَه بمرونة مع أهواء السياسة الأميركيّة. فعندما اقتضى الأمر التحضير للحرب على العراق، أفردت «العربية» تقاريرَ مسهبة عن قمع صدام حسين وظلمه. وعندما رفعت الإدارة الأميركية سيفَ التحريض المذهبي ضد إيران، ماشتها السعودية وأوقفت بث أي تقرير عن ظلم صدام ووحشيته. على العكس، أصبح صدام رمزاً محبّباً بوجه إيران. لكن «العربية» تتخّصص أكثر ما تتخصّص في الترويج لـ«مجالس الصحوة» (وهي نموذج عراقي لـ«روابط القرى» التي أنشأها الاحتلال الصهيوني على أرض فلسطين العزيزة بعد 1967)، وإظهارها كتعبير عن ديموقراطيّة الإغريق المباشرة. فعبد الستار أبو ريشا (وخليفته بعدما نُحر ــــ وذلك بعدما نَحر هو 40 خروفاً لجورج بوش ــــ أحمد أبو ريشا) كان بطلَ الشاشة، لا وحشَها مثل فريد شوقي في الأفلام المصرية القديمة. وكما روّج الإعلام السعودي لفكر القاعدة أثناء الحرب الباردة (ولعبادة شخصيّة صدّام في الحرب العراقيّة ــــ الإيرانيّة)، ها هو يروّج لنسق عجيب من الفكر «الليبرالي» ــــ البوشي مع مزيج متنافر من سوقيّة إباحيّة (حتى في برامج الأخبار) ومن تزمّت ديني وهّابي (يُمنع في صحافة آل سعود، مثلاً، ذكر اسم كتاب «النبي» لجبران كما يروي كاتب سابق في «الحياة»). وهذه المعادلة المُخادعة تختصر إعلام آل سعود. لكن تقييم محطة «العربية» ودورها في الدعاية الأميركية بالعربية يحتاج إلى التطرّق للسقوط الذريع لمحطة «الحرة». وعلّقت الحكومة الأميركية الآمال الكبار على محطة «الحرة» قبل أن تصدر النعاوى المتتالية لها في الصحافة الأميركية. اكتشف الإعلام الأميركي متأخّراً أن أكثر من ربع مليار دولار ذهبت أدراج الرياح، وأن المحطة منسيّة لدى المشاهد العربي. كانت الإدارة تتوقّع معاداة شعبيّة عربيّة لمحطّة «الحرة»، لكن التجاهل أقسى بكثير من العداء. وهذا يفسّر كيف أن الإدارة الأميركية زادت من اعتمادِها على محطة «العربية» للتعويض عن الخسارة الكبرى في أفول «الحرة» المحتضرة. و»العربية» مجانيّة. هذا الكرم السعودي على الرجل الأبيض منذ تفجّر النفط. وهي تنقل كل ما تريد الإدارة الأميركية مباشرة على الهواء، مثلما تفعل «الجزيرة» بعد تزايد انتقاد الكونغرس لنقل أشرطة بن لادن على شاشتها (وأظهرت دراسة أعدّها مدير سابق لمكتب «الجزيرة» في واشنطن أن المحطّة في السنوات الأولى التي تلت 11 أيلول بثّت 11 ساعة من أشرطة بن لادن مقابل 500 ساعة لأشرطة بن بوش). وللدعاية السياسية شروط وأصول. وهي تفترض أو تتطلّب تماشياً في الحد الأدنى بين أهواء الجمهور وتوجّهات المحطّة. لكن دعاية «العربية» تتناقض مع المبادئ الأساسيّة للجمهور وتهينها، ولا سيما في موضوع فلسطين وموضوع العداء لحروب أميركا. وهذه المعضلة تحدّ من إمكان التأثير العريض، باستثناء جمهور مصباح الأحدب في لبنان. (ومصباح الأحدب، الذي كان يدبّج المدائح في بشار الأسد، ينتظر اليوم تدخلاً من ملك السعودية ومن بن لادن لتعزيز موقعه الانتخابي). ويمكن محطة «العربيّة» أن تلعب دوراً أساسياً في حشد الجمهور الانتخابي في لبنان، ويمكن الاستعانة بخبرات إيلي ناكوزي في التبعئة الانتخابيّة. وقد تضطر جيزيل خوري لإعداد برنامج «وثائقي» عن خالد ضاهر. تسمّروا أمام الشاشة من الآن. It’s the weekend! Shouldn’t you be working, not wasting time on Syria Comment? Multitasking Qifa. Multitasking : ) … I will forward to your email proof that I am working at the same time. I just watched an interview with President Assad on Aljazeera. He was asked about Syria’s relations with Saudi Arabia and Egypt. He replied (with a smile!) … they are not good. He also said that he will go to Iran to discuss ideas and questions from President Sarkozy. Then he will communicate back with the French president. Are you sure that it is Asma who is wearing the PM’S dress and not the other way around? As to your “willingness to kill” reminder, I thought that my reference to “brutality” was clear, no? You seem to criticize my comment but towards the need you said that you “know what I mean”. Just 39 percent of U.S. Jews report that religion is important in their daily lives, well below the overall national average. Not sure why this statistic is important for you. Jews are really going to have negligible influence on the presidential election. Whether they live in NY, CA, MD, MA, IL, etc, we already know these states are going to vote democrat (Obama) with are without their relatively large jewish population. Moreover, despite Obama’s reluctance to confront terrorist states, jews will still vote for the liberal candidate just like they did for Gore and Kerry. The important statistic I think you should be focusing on is the popular vote. Last I heard, Rasmussen has Obama and McCain tied at about 45% each. This isn’t so go for Obama. Historically democrat challengers who have won the election faired much higher at this stage of the game. Moreover, Obama is moving from hard Left to centrist, and this will deflate his hard-core supporters, while making him look like a shadow of John McCain. Obama is not a “shoe-in” for president by any stretch of the imagination. The next step to watch will be who they pick for VP. What was interesting for me in that poll was showing that American Jews are not a block that participates in neocon conspiracies, supports Iraq wars, and work as soldiers for whatever AIPAC lobbies for. Here is the always interesting Zvi Bar’el… quoting Qaddafi’s smart comment on the Paris summit. “We Arabs have not been able to unite. How can we have a union with Scotland or Scandinavia or Israel?” You have to admit that Libyan leader Muammar Gadhafi, who made this statement last week, is a perceptive man. His remarks were aimed directly at the Union for the Mediterranean, which convenes today with great pomp and circumstance in Paris. French President Nicolas Sarkozy’s flagship project has already raised the hackles of half the countries of Europe – because of a feared split in the European Union – and half the states of the Mediterranean – because of Israel’s participation in the conference. But Gadhafi’s main opposition was to the colonialist approach embodied in the union, led by France, which – in his eyes – is taking parts of the Mediterranean and parts of Africa to create a framework that will be led, de facto, by European states. There is some justification for Gadhafi’s anger, the most convincing proof for which comes, somewhat surprisingly, from Turkey. Ankara views the conference as a French maneuver aimed at blocking Turkey’s entry into the EU, and not without cause. Sarkozy spearheads the opposition to bringing the large, unemployment-battered Islamic state, most of whose territory is in Asia, into the wealthy, Christian European Union. He even tried to pass legislation requiring a referendum in France on the addition of new EU member states, based on the assumption that French citizens would oppose the inclusion of more Muslims in the EU. The cultural gaps between Europe and Turkey, Sarkozy said, make Turkey more suitable to a different framework of nations, one that also has Arab members, than to full membership in the EU itself. Islam is the antithesis of democracy, declares France self-righteously, and Islamic states should know their place. Nevertheless, just who is the pillar of Turkish democracy? When Bernard Kouchner, Sarkozy’s foreign minister, speaks of Turkey’s army, he emphasizes its “very important role … for democracy and the separation of mosque and state.” In Turkey the army is responsible for protecting Ataturk’s secular constitution, and the fact that Turkey’s army has already carried out three military coups and is behind the current demand to shut down the ruling party does not disturb France. Neither does secular Turkey’s 1974 invasion of Cyprus. When it’s necessary to block the entry of Islam into Europe it is permissible to tear out and throw away a few pages from history. No wonder Turkey is very suspicious about the Union for the Mediterranean. But ironically it is anti-Islamic France that is considered a friend of the Arab states. Sarkozy has taken some flak, admittedly, in the Arab press for his speeches of support for Israel and his other “demonstrations of love for the Zionists,” but that does not stop Syrian President Bashar Assad from viewing him as a true friend, Egyptian President Hosni Mubarak from visiting Paris, or Lebanon from taking him on as a partner. Religious faith or “culture gaps” are one thing, interests are another. It’s not just about contracts and money, which of course have no color or smell, neither religious nor national. France is perceived as a friend of the Arabs because America is a friend of Israel. France’s colonial history has been put into storage because American colonialism has come to the region. The U.S. invaded Iraq and Afghanistan and is holding the hand of Israel, which is keeping the Palestinians under a regime of occupation. France is no saint – it is afraid of Islam and its citizens view Arabs as an internal threat – but in comparison to Washington, Paris is pure as the driven sand. And now a “danger” is creeping toward this clear demarcation between Israel and the Arabs, France and America. Sarkozy’s Union for the Mediterranean threatens to destroy this comparison, to draw Israel closer to the space in which the Arab states had felt relatively safe in terms of foreign relations. They are being asked to shake Israel’s hand even before it solves its problems with the Palestinians, the Syrians and the Lebanese. They are being imprisoned in a Mediterranean circle with Israel, while the Arab circle to which they so forcefully belong is being threatened by Israel. Israel may be able to say with satisfaction that it succeeded in joining yet another framework with Arab members, that France is once again a close friend and that its position in the world has never been better. But when the conference in Paris is over, Israel will not return to agreements over fishing in the Mediterranean or joint marine rescue drills. Gaza, Ramallah, the Golan Heights, Hezbollah and Hamas will not disappear, and they, of course, were not invited to Sarkozy’s presidential palace. France is not only anti-Islamic but anti-religious. They abhor all religions. They appear more anti-Islamic because Muslims still take their religion seriously while “Christians” don’t. Religiosity is looked down upon in France. This is the case because religiosity is viewed by them as a superstition, primitive, backwards and irrational. They are for freedom from religion. Religiosity is looked down upon in France. Um, can you explain why Sarkozy has accepted the post of honorary canon of the Basilica of Saint John Lateran, once granted to the kings of France? BTW, Sarkozy is to visit Damascus by mid September latest. Does that mean Syria’s order for new Airbus airliners is reinstated? Also, I was astounded by the words that Sarkozy placed in Assad’s mouth yesterday: “Pour la France, la détention de l’arme nucléaire par l’Iran n’est pas envisageable. Le président Bachar Al-Assad s’en tient à la déclaration des autorités iraniennes sur le fait qu’elles n’ont pas la volonté d’accéder à cette arme.” What does this mean? Yes, that is why is the chairman of the conservative Gaullist party and the new age king of France. Let’s wait and hear the public statement after the summit meating is over. As for secular France, there is a shift, not only in France, but in many western countries. Obama was never from the left nor the hard-left and he is not moving to the center unless you mean what his political-handlers are calling the center. Now if one means what a majority of Americans want as the center then he is moving away from statistical center and into the politically expedient “center”. In other words, you can’t be a populist and rule the empire. Anyone who thinks Obama is going to pull the troops out of Iraq is really naive. And by the way he apposing the invasion of Iraq is not a “leftist” thing. Olmert: “Peace deal closer than ever”. So says he, but he is on his way out and who will replace him ? Plus, Abbas without Hamas …. it cannot work. Aljazeera says that President Assad was not present when Olmert delivered his speech in Paris. The president said that peace with Israel will take anywhere from 6 months to 30 months to materialize. In Iran, Ahmadinejad welcomed an American consulate in Tehran if the Americans are interested .. he says that there are many wise peopel in Washington, and both sides need to work hard to establish close relations between the American and Iranian people .. While this situation was later changed, and Kuwaiti women were “given” the right to vote later. This indicates the type of “policy” discussion one can expect from an Islamist dominated parliament. Just notice how much time does the Jordanian parliament spend discussing video clips, you can extrapolate on to others. The fact that the economic situation is improving a little in Turkey may have something to do with the current ruling party. Yet, the Islamic party took power after decades of secular (one can even say fundamentalist secular) governments that established much of the institutional and economical infrastructure in the country. My problem with religious parties has more to do with their social agendas than with their economical one (if they have one). You claim that conservative Syrians are not Taliban. Granted, but I still remember many friday prayers in the late 70s, where the highly influential imam spent at least an hour on nonsense such as the sins of mixed education in universities and on scaring the congregation by arguing that all their daughters will bear illegitimate children, become drunkard prostitutes, and live a life of sin if they send them to the sinful mixed university. And this was in an upper middle class area of town. Just watch some of these preachers on TV, most of the time their discussions focus on issues that any respectable commentator, would have referred to a doctor, a lawyer, or a social worker instead of going into circular arguments and digging into arcane norms to answer the question. The problem is that they always have an answer for whatever question is posed to them, they never say, sorry I do not know, this is not a spiritual matter and it is out of my area of expertise. We see the same stuff from christian televangelists. From where I stand, you can believe what you want, just don’t legislate your morality on me or on others. In Syria, the Ikhwan’s program, during much of their struggle with the regime was very sectarian. The language of their pamphlets was divisive, sectarian, and called for murder and mayhem. Have they changed, may be. They may now believe in one man (no pun intended here), one vote, ONCE. I am afraid that most Islamist parties in the Arab world have an agenda in mind, much of which is dedicated to the exclusion of half of our societies from economic, social, and political decisions. In essence, they start by assuming that women are the source of social ills in the society, not the victims. Spare me the cliche of motherhood significance, what if a woman does not want to have children, is she then not so important?. Here is an example, in 2000, the islamist controlled Jordanian parliament rejected a law that would have criminalized the so called “honor killing”. Turkey and Malaysia are a little different. Why, I can’t answer that, it is beyond my expertise. I also recall that forcing Hijab and educational segregation were rather prominent on the political agenda of the Islamic front in Algeria in 1992. Not sure what a “neocon conspricacy” is, but you are absolutely right, Jews by and large, were NOT supporters of the war in Iraq. Jews, by and large, ARE supporters of AIPAC. For all those (like you Alex) that are keenly interested in the phenomenon of “American Jews”, I usually find that a large amount of mythology comes along with the interest. Is there a clip of the interview with President al-Assad on Al-Jazeera? Thanks. One should vote for McCain if one wants to accelerate the demise of the US empire, and one should vote for Obama if one wants to prolong this inevitable demise. PARIS (Reuters) – Syria was not to blame for a deadly attack on French troops in 1983, a senior French official said on Sunday, hoping to ease tension a day before the Syrian president attends the Bastille Day army parade in Paris. Instead, the official in President Nicolas Sarkozy’s office pinned the blame on Iran and Hezbollah. Sarkozy’s decision to invite Syrian President Bashar al-Assad to the July 14 parade angered some French soldiers and prompted calls for those marching to show their displeasure, possibly by not looking up at the official stand. Syria had been suspected of involvement in the truck bomb attack 25 years ago on French military headquarters in Lebanon, known as the Drakkar, which killed 58 French troops who were part of an international peacekeeping force. To a large extent, I agree with you on the latter part. But also much AIPAC’s support comes from the christian zionist movement. However, many American Jews find AIPAC monopoly on representing their views quite disturbing. New efforts are springing up starting from George Soros initiative and more recently with the formation of J-Street lobby, which as I understand, hopes to attract policy makers into a more balanced, less militant, discussion of Israel-US relationship. And to highlight that being pro-Israel does not necessarily mean rewarding the criminality of Israeli governments. I wish them all luck. They are in their infancy, but I have hopes for them, because, if you follow the current mood in the US, AIPAC is feared, but not well liked. And poeple are starting to ask, why is it OK to discuss issues in the Israeli press, with out being labled anti-smite but not in our own press. What really bothers me is that I have noticed that as AIPAC tries so hard to demonstrate their power by ensuring that no politician who does not pass their litmus test of blind support to Likudnicks policies, by conducting relentless forceful campaigns of smear to limit discussions with the victims on many occasion being Jewish intellectuals, and by parading such large number of luminaries for some cheap talk during their gala style convention, many Americans, who are otherwise decent beings, are buying into the myth of Jewish control. In many cases, the other side of the argument, instead of being presented in appropriate platforms, is forced into the shadow and reasonable arguments get mixed with non-sense and with racism and antisemitism. J-Street and similar efforts are trying to provide a respectable platform for opposing views. For that, they have my respect. And if they later earn it, may be my support. When they want to boycott Syria, they blame her for everything, when they want to undo that boycott, they move the blame to others. I heard the interview live, I don’t think there is a clip online yet. Good description of Obama’s centrist position. Lofty talks about programs, but none of his program has a true progressive foundation. He is even closer to the right than either one of the Clintons. Edwards was a populist, but the only leftist candidate was Kuchinich. This is a sad day for American Progressives. They went for the aura of youth, and rejected their true representative. Walla habibi, it’s not so different from the way that everybody operates! When relations with the West are bad, then the U.S./Zionist conspiracy is responsible for all the problems, from the backwardness of the region to the spoiled milk in my fridge. When relations are good, walla the problems are complex, cannot be blamed on any single party, etc. etc. The shift in France and in Europe has more to do with irrational fear of “Islamization” than with true connection to religion. I find Ugarit’s description of France quite reasonable. At this point in time, the shift towards religiosity is probably a mere artifact of the internal clash between true secularism, which Europe likes to profess, and racism, which Europe likes to deny. If they maintain their secularism, then they have to accept the rights of their Muslim populations to live as they want since there are little or no intellectual grounds in secularism to allow discriminatory practices against religious and ethnic minorities. Since they do not want to acknowledge racism, some of them find that their only defense is to emphasize Christian Europe. By that they remove the ethnic nature of their fears, find a unifying factors that brings together german, french, italian, swiss, etc.. bigots under one platform. It also unifies, in their minds, much of their brown populations into a single “Islamic” entity that represents a threat to their unifying “Christianity”. Can we find another way to end the Empire without destroying the world. aren’t they ashamed speaking lebanese dialect in a news report? I used to think this way a while ago, but now i ask myself, Why should they be ashamed to talk in their own dialect? I find no compelling reason for such shame, can you please enlighten me? Let me ask you, say you are in a coffee shop with some of your friends discussing some highly intellectual matters, would you be speaking classical Arabic, or would you use whatever dialect you grew up with. In recent years, news reports, and particularly interviews and talk shows have become very much like coffee shop conversations. My new mantra is live and let live. I love classical Arabic language. I love both classical and modern poetry, but at the same time, have you listened to Omar a l-Farra?. May be i am a little strange, I do not know Spanish, but I cherish listening to Pablo Neruda’s voice reading some of his poems. Nor do I know any of two dominant chinese dialects, but I love listening to some chinese opera and traditional songs. Every language and dialect has its own music and to my ears, they are all beautiful. I can enjoy that music, at least once in a while. I am normally a proponent of dialect (especially in literature), but I have to admit that the LBC gal sounded weird. Maybe because she was reading a text in Modern Standard Arabic while pronouncing it in Lebanese. What you wrote is mostly true. But I had many discussions with French, Canadian and other western intellectuals. After 9/11, they genuinely changed … they were not necessarily all racist. They started to read Daniel Pipes and others who published selective translations from the Quran, and their intelligence agencies shared conversations they monitored in local mosques and meeting places of some of the fundamentalists who lived in Europe .. the result was alarming to them… promising to make Europe Islamic by 2020 … etc. The combined fear of fundamentalist Islam and some secret, Bizarre, American imperialists, made them find relief in the original peaceful realm of the teaching of Jesus (not necessarily “church”) … and new-age, spiritual religions too. You are getting very mellow and accepting of the fate of Syrians compared with your old self. As the price of everything trebles and a rapidly expanding proportion of the Syrian population struggles to afford even basic food and fuel, let’s watch brilliant beloved Assad fill those sordid overcrowded prisons even more. In the absence of any solution he’ll be treating food and fuel riots as serious political crimes. Is it true that he just petulantly refused to sit at the same table as Olmert in Paris even though it was a huge table and they were at far opposite ends? If you can’t make up your mind and hold fast don’t climb onto the showcase bandwagon. As for the mass conversion “Islamization” by 2020, if Europeans are scared of that, i am in fact, more scared by the apparent “group think” and by the ability of societies who have enjoyed the age of reason to completely suspend reason. Does anyone believe that even 2220 such radical conversion is possible. On a closer look at the photo (with all due respect to Jamal), is that guy going downstairs in the background king Abdulla of Jordan, he looks either baffled, confused, or jealous? That’s why they keep me around this joint. That was a security agent, not the king of Jordan. The Jordanian king did not appear anywhere, not even int he background of any picture. What makes you think the US’s demise is “inevitable”? What factors make you draw this conclusion? What other way can you find “to end the Empire without destroying the world”? But I had many discussions with French, Canadian and other western intellectuals. After 9/11, they genuinely changed … they were not necessarily all racist. There is also the unspoken belief in conspiracy theories. Which “intellectuals” did you speak to? Why would an intellectual be racist? What conspricacy theories are “unspoken”? However, many American Jews find AIPAC monopoly on representing their views quite disturbing. How do you define many? Do you have a percentage in mind? New efforts are springing up starting from George Soros initiative and more recently with the formation of J-Street lobby, which as I understand, hopes to attract policy makers into a more balanced, less militant, discussion of Israel-US relationship. Although I know very little about George Soros, here’s something he said in the NY Times about 1 year ago. I am not a Zionist, nor am I am a practicing Jew, but I have a great deal of sympathy for my fellow Jews and a deep concern for the survival of Israel. I did not want to provide fodder to the enemies of Israel. I rationalized my position by saying that if I wanted to voice critical views, I ought to move to Israel. But since there were many Israelis who held such views my voice was not needed, and I had many other battles to fight. Like I’ve been trying to say here, the Shais and George Soroses are a dime a dozen. And to highlight that being pro-Israel does not necessarily mean rewarding the criminality of Israeli governments. I wish them all luck. I do to, although I’m not totally aware of Israel’s “criminality”. And I’m also not sure why Israel’s criminality always trumps the criminality of surrounding Arab governments. They are in their infancy, but I have hopes for them, because, if you follow the current mood in the US, AIPAC is feared, but not well liked. I’m not aware of any supporter of AIPAC who doesn’t like them. But if you have some examples, I would sure like to read about it. And poeple are starting to ask, why is it OK to discuss issues in the Israeli press, with out being labled anti-smite but not in our own press. People have been discussing “issues in the Israel press” since Israel was born 60 years ago. IMHO, if one is critical of the Israeli side without taking into account Israel’s real (and not imagined) security concerns, than most likely, anti-semitism is at the root of the issue. What really bothers me is that I have noticed that as AIPAC tries so hard to demonstrate their power by ensuring that no politician who does not pass their litmus test of blind support to Likudnicks policies, by conducting relentless forceful campaigns of smear to limit discussions with the victims on many occasion being Jewish intellectuals, and by parading such large number of luminaries for some cheap talk during their gala style convention, many Americans, who are otherwise decent beings, are buying into the myth of Jewish control. A bit of a run-on sentence. What makes you think AIPAC supports “Likudnick policies”? How do you know they don’t support Kadima, Labor or even Meretz policies? Does AIPAC’s support of Israel and Zionism automatically mean they support “Likudnic policies” and if AIPAC supports the peace process between the current GOI and Assad, is this support a “Likudnick policy”? Can you clarify for the forum: What is “The Big Lie”? Do you believe it to be true? Every empire comes to an end. That doesn’t mean the US comes to an end it would just be a humbled nation like many other nations. Empires begin to collapse when they no longer can afford their military expansion. The US is the biggest debtor in the world. That’s one major factor and when the foreign debt collectors come knocking on the door we know we’re close to the end, but that’s when the US will become even more violent. It will be in decades. Darn the image isn’t appearing! Not sure if that’s possible. The US will be getting more violent as it realizes that its hegemonic power is coming to an end. No, I do not believe in conspiracy theories. UBL proudly took credit for what happened. I was explaining to OTW that in France 9/11 affected people in two ways .. they got scared of fundamentalist Islam, and they got convinced that there are some seriously bad people in power in Washington. I am a US citizen, but I do not like my country to be a military empire. We have so many military bases throughout the world, and our leaders, no matter what their political stripe is, have been supporting an ever expanding militarization of my country. This disturbs me. Ever had the chance to read Chalmer Johnson?. As for how, i think that by voting for someone like Kucinich, and by not voting for the expedient (“electable”) candidate, we may make a difference. In fact, I would favor a true parliamentarian multi party system here in the US, I am not sure it is very feasible at least in the near future, but I will not stop calling for one. I believe in such situation, the influence of various lobbies, including the ones I like such as the teachers union, will be greatly diminished. Fine by me. People have been discussing “issues in the Israel press” since Israel was born 60 years ago. IMHO, if one is critical of the Israeli side without taking into account Israel’s real (and not imagined) security concerns, than most likely, anti-semitism is at the root of the issue. Not necessarily, you generalize and paint too many people with the wrong brush. Your argument is solely based on assuming that everyone has a duty to internalize Israel’s security concerns (real or imagined) or be anti-semitic if they dare to criticize Isreali government and military practices. Some activists are single issue activists, who may be driven by their desire to ensure that women, everywhere, including Gaza, can deliver their babies in hospitals, not at hostile military posts. Others may be concerned about people not having their homes bulldozed. When the situation is dire, moral equivalence takes a back seat.For anyone to request that they must first internalized one side’s security concern is rather stand-offish and insecure at the same time. I agree, it was a run-on sentence. My writing suffers that weakness. Thanks for point that out. AIPAC supports likudnicks policy when it tirelessly introduces very punitive anti-palestinian, anti-syrian legislations. Please do not ask me to count and give you the exact HR and SR numbers. You know what I am talking about. 1. I did not say “Israel criminality” I said, “rewarding the criminality of Israeli governments”. 2. Where did I indicate that one criminality trumps another? No percentage, how about more than the 20 that I know of :). May be I should have said, some? would that work for you? The movie clip you have kindly posted, which is a standard “propaganda” preaches more to the quire than to outsiders. I know you are not adopting the content. But let us look at it rationally. First, when citing the evolution of worldwide percentage of Moslims (thanks for pointing minute 2:00, i could have missed that), the clip makes no attempt to identify the breakdown of this growth. Is it population growth in Islamic countries, or is it conversion. Later, we read that Islam has gained 20,000 converts in a single year. As much as I hate to adopt Akbar’s style, which year?, is that a constant number, what percentage does that pose to the actual population of each country. Then we read about the fact that there are 30,000 inmate converts/year. True, but what do these converts do after their release. If All Gore sees this movie clip, he could easily re-title it as “Unless Stopped, Population Growth Will Continue to Increase the “Vulnerability” of World’s Muslims to the Impacts of Climate Change”. This would arguably, be more accurate description. I feel that I have been a little obnoxious, please let me know if that is true. Every empire comes to an end. That doesn’t mean the US comes to an end it would just be a humbled nation like many other nations. From your previous comment about “inevitible demise” and your reply above, would it be a stretch for me to assume you would like to see the “inevitible demise” or the humbling of the United States? The US is the biggest debtor in the world. The US is also the biggest producer in the world (GDP). Is this wishful thinking or did you know the exact date? No, I do not believe in conspiracy theories. I believe you, I was just wondering why you had a link to a book called “The Big Lie”. No doubt they got scared of fundamentalist Islam…scared enough to replace Chirac with Sarko. I am a US citizen, but I do not like my country to be a military empire. I’m not sure what that means: “a military empire”. Please elaborate. Then we will have to agree to disagree. Israel, like all countries, has the right to self defense. If every country has that right except Israel, then I can only attribute that to anti-semitism. What else could I attribute that to? Your argument is solely based on assuming that everyone has a duty to internalize Israel’s security concerns (real or imagined) or be anti-semitic if they dare to criticize Isreali government and military practices. Internalize, externalize, whatever you want to call it, if one cannot recognize that Israel has real security concerns and/or permit Israel the right of self-defense – then (IMHO) they are anti-semitic. I know you may think this is quite a “generalization”, but, as a Jew and a supporter of Israel, I stick to this opinion and I want you and the rest of the forum to know it. OK – I was just trying to find out if AIPAC had any friends from other Israeli parties as well. You’re giving me the impression that AIPAC = LIKUD. I’m just here to tell you (if that was your intent) that “equation” is a bit inaccurate. In fact, very inaccurate. I never intended to give the impression that AIPAC=Likud. Given that you definitely know more about AIPAC’s relationships with Israeli politics. I will have to say, I stand corrected on that. All I know is that they have never failed to support and push the Likud agenda in the past few years. If they have supported other agendas, such as peace now, that would be good. Don’t worry, we are all obnoxious here. I do not even bother trying to understand what really happened in 9/11 and if it was anything different from the official version. As for the growth of Islam in Europe … I agree with you … there is no drama there. But the point I was trying to make is that it is not right to blame the negative reaction towards Islam on racism in Europe … partially, maybe, but there are genuine fears that need to be addressed, there are lessons to be learned from the mistakes made. And the video I linked is one sample of these mistakes .. when the organization that prepared that video wanted the whole world to believe that Islam will take over … his propaganda probably did cause some of those who watched it to be alarmed and to seek measures to limit the growth and influence of Islam in their European countries. Thanks for clarifying the issue of racism and making the point for the existence of genuine fears. I am occasionally blinded by my hypersensitivity to racism. Is it possible that my impression is caused by the fact that the racist part of this fear is the more outspoken one? As for the negative impact of mistaken actions, I agree fully. We both know that it will take moderate Muslims in Europe lots of efforts to correct the impacts of such damaging propaganda. Ending, once and for all, this notion of War on Terror, and converting it into true criminal justice issue here in the US, will probably have a calming effect on both sides. Alex, what’s your problem with Siniora? He is gentle, wise and brave ….Syria deserves a PM like him. Alex, the Saudi Lebanese relations are deep rooted in history and it’s known that when Lebanon was called Switzerland of the Middle East it was mostly due to this relation as you know Lebanon was the banker, the school, the university, the hospital, the resort of Saudi Arabia and Kuwait. The Saudi elite had strong ties with the Lebanese Christian elite, we know the excellent relations between the president Camille Chamoun and Saudi Arabia, or Hamid Bey Franjiyeh who lived years in Saudi Arabia as the personal adviser of the king and paradoxically the relation between the brotherhood, were always difficult, the aims of the foreigner Saudi policy should not always be mixed with their internal policy. But there is also a clear Saudi fear from a democratic Syria or Egypt because it will probably have an impact on Saudi Arabia too and it will force them to democratize …But Alex ,where is my interest as Syrian with these sectarian shia groups be it hizbollah ,amal or the death squads in Iraq, those are a fifth column and don’t be happy with hizbollah ,no one other than us will disarm them ,be it this regime or the next one.Syria as nation and people has no interest to see Iraq a playground for the Iranian regime with the obvious help of the Americans. All these sectarian Shia groups from hizbollah to the death squads in Iraq are a Shia version of al Qaida …both should be fought. As for the non takfiri shias ,like Ibrahim Shamsedin ,sheikh Ali Al Amine or Jawad Khalisi and Ahmad al Baghdadi of Iraq ,they are part of ourselves and no differences between us and them. Btw the relations between the family of shia scholars Al Amine and Damascus is old. Ehsani Bey ,I agree with you and this is why in Secular Turkey ,the minorities ,especially the Alevis and Nusayris are excluded from important security posts .Ehsani ,but it was not completely our fault, we should not forget that most of the Syrian security forces used during the French mandates were from the minorities and When we had our independence , the collaborators were allowed to keep their places without being worried by the post independence government. We suffered a lot and still suffer from this mistake but this is a good lesson for us and for our future generations. But it should not be understood that we we will oppress the alawite community or marginalize them.If the post asad governments do that and punish the community on the whole ,so what’s the difference between us and the criminals like hafez and rifaat? The syrian brotherhood are what they are ,muslim pietists and conservative people but,i dont think that their spiritual leaders , Mustafa al Sibai,AbuGhodda http://www.aboghodda.com/Biography-Eng.htm ,Al Tantawi http://www.alitantawi.com/ or Isam al Attar were a model of extremism and extreme bigotry. im not saying that Im a “jahbath” in arabic. unfortunately, in resent years, whenever i discus intellectual / technical issues with my friends, i switch to english unintentionally. but i attribute that to the fact that my knowledge sources are mostly in english. so I mainly face problems with terminology. it sounds weird to me when 2 arab guys conversate in english. but anyway a news report is not like half-drunk bunch of guys discussing big bang theory, reporters should have the decency to speak proper arabic. maybe you find that ok becouse its lebanese dialect, but what if Saudis, Algerians and others start doing the same? my trusted sources told me that sociologists relate the average IQ level to the level of language sophistication. so the more sophisticated the better. a dialect is inferior to classical arabic. don’t get me wrong I like my dialect but I think that it should be used in limited places. I would not equate Hizbullah with Al-Quaeda, a better analogy would be with Hamas. Al-Quaeda is a purely terrorist organisation that does not have a clear political agenda nor does it represent the interests of the majority of any group. Hizbullah and Hamas have won elections in their areas and represent mainstream views of their electorates. The fact that you do not agree with their views does not mean that they are Al-Quaeda. All these sectarian Shia groups from hizbollah to the death squads in Iraq are a Shia version of al Qaida which is a Saudi creation, do you ever wonder why? We know that Hezbollah was born out as a reaction to the neglect and mishandling of successive lebanese governemnts of South Lebanon. Could you explain to me why there are so many saudi sunni terrorists? What is so wrong with Saudi arabia that they breed so many terrorists? Thanks for your response. Please notice that I did not mean to offend you. I also revert to English, and occasionally mix the two languages where the sentence starts Arabic and ends English 🙂 . I.Q. aside, LBC is first and foremost a Lebanese station. Aljazeera, on the other hand, is an Arab-world station. That where I see the difference and will settle for no less than proper classical Arabic from Aljazeera’s correspondents, anchors, and hopefully commentators. However, aesthetically, a dialect, whatever it is, is more pleasant to me than butchered classical Arabic. The former can be nice, but the latter is aesthetically “wrong” and borderline repulsive . You may be right with respect to the Lebanese dialect. Most Syrians of my generation grew up listening not only to Fayrouz songs, but to entire operettas. I say “may be”, because the success of Syrian dramas over the past few years, brought the old Damascus dialect raging popularity in the western parts of the Arab world. Can a successful Algerian or Moroccan miniseries do the same in the eastern wing. It would be interesting to see if that occurs. Who knows, may be satellite channels will eventually result in a new “pan-arabic” simplified dialect. I tend to agree that dialect and common speech are both inferior, from linguistic, point of view to written, grammatically regulated structures. But I am not a linguist. I have to go back and research the issue. As we know, in language, grammar follows the formation of language, mainly to anchor it to a certain point in its evolution. no offense taken. I agree with you.”butchered” classical Arabic is so disturbing.I’d prefer to listen to a dialect instead. but don’t you think that fayriuz songs in proper arabic have special feelings? My problem with Seniora is that he worships the king of Saudi Arabia. You don’t want me to link the thing he wrote at Asharq Alawsat again I’m sure. Instead of saying Syria has no interest with Iran or Hizbollah … I prefer to believe that Syria has an interest in befriending Iran, Hizbollah, Hamas … and turkey, Saudi Arabia, Qatar … Israel, and Lebanon… everyone in the neighborhood. When Saudi Arabia decides to respect Syria’s role, and when the Saudis stop playing dangerous sectarian games … I will be the first to support excellent relations Between Syria and the kingdom. Until then, I don’t care what natural or historic relations the Saudis had with Syria or with Lebanon … they caused enough trouble to Syria and to the whole Middle East… it is better to keep some distance from them. After peace with Israel you will see much more interaction with Turkey, and less Iran … and in Lebanon they will have no reason to worry about Hizbollah anymore after it goes into regular politics. You played a “cool trick” on me here. I have been, for the past few hours, reading various works from Tantawis website. While I still disagree with many of his views. I have to say, wow, what an intellectual Giant this man was. His Arabic style was breath-taking. And those who describe his works as Assahl-ul-Mumtane3 were absolutely right. I found some of his views quite appealing, was offended by some other views, and this is only from one book and few scattered articles that are available online. On many issues, which i believe were important, he was open minded, and i might say, beyond his times. For the 40’s and 50’s of the past century, one can easily state that he was a reformer. This man has advocated “salafee” approach that draws mainly from the first 100 years of Islamic thoughts, but only so that new thoughts could be developed independent of the dark ages. The sad point is that some of those claiming to follow his teachings fell into what he warned them, quite forcefully, against. May be at some point in the future, I will have sometime to expand more on why I disagree with some of his views. But for now, thanks for the pointer. It was worthwhile reading. As my friend Alex has so rightly stated; your use of extremes and absolutes is way too unfair. I agree with you about the exodus that has plagued Aleppo and Syria as a whole; the country is less wealthy than most of its residents could wish for. So they migrate. What has that got to do with the way the country is being managed? Are you going to tell me that if Al Ikhwan were in power they would have done a better job? They would have eradicated corruption? (You don’t seriously think that corruption is Assad’s invention?). And even if they do better job on the economic front (which I highly doubt), would it be worthy enough to balance the negative impact the Ekhwan rule is going to have on freedoms? Or are you telling me that there will be more freedoms in Syria in the envisioned rein of Ekhwan that there are today? I am all for more freedom and more breathing space for everyone. Your mistake is that you reduce Syria’s cause to a singular problem which is the viciousness of the regime. I simply refuse to accept that. Yes there was a 9/11 conspiracy. 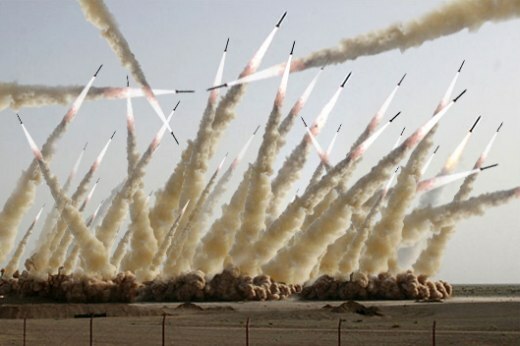 Nineteen men conspired to hijack civilian airlines and use them as guided missiles. My feeling regarding the question of if the MB had been in power could not have avoided the current problems plagued Syria is not valid question. I think the intellectual approach compels us to be revisionists to our history or we will fall in the status-quo for ever. until 1973 Syrians intellectuals and elites did not question much the internal conflict in the struggle for power. By 1980s we stood on the side watching the MB struggling with the totalitarian system. Most people did not cheer for one against the other. People showed much patient with the dictator and now it seems that they are not going to tolerate his son using the same tactic to stay in power by playing the external affair card. I started realizing that I can not ignore neither disfranchise any segments or parts of the Syrians for any reason. And another important point, if some ever thought of excusing the sons from the sins of their fathers they should apply this to all. The system failure is not anymore for discussion (actually admitted by the regime) and its continuous failure is very obvious to many. It is funny picture ironic situation of the System still using the symbols of Unity, “no” freedom and socialism which he chewed on them for ages and turned 180 degrees from on the hands of the same people and the System (or the regime) ended up standing on no legs and without ideology. I thin the to try to excuse this system by showing no criticism of its failure, or trying to turn people against each other based on scare tactics, is not gaining any sympathy anymore. The exodus issue is not too clear in the country but very clear in the Diaspora and it is going to hunt the country sooner or later. People in Syria left the country not because the country is not wealthy and people are money monger going after wealth, it is because of the exclusion, bad system, insisting backwardness and slavery treatment of its citizens by the regime, the officials and its bureaucracy. It is now most clear to people that the System turned into a collector of taxes not only from who left but even from the ones who left. A7sant dear OFF THE WALL ,he was a very moderate salafi.Btw,Salafis were always a minority in the syrian brotherhood. Offended ,who told u that the only alternative to the asadist regime are/were the brotherhood ,this is impossible ,they wouldn’t get more than 30 % of votes.And yes before this regime ,corruption was marginal ,it was sacrilegious ,nobody would have accepted to give his daughter to a corrupt man and also most of the civil servants were from good families so the reputation of the familly was not easy to betray. In bashar asad interviews ,you also noticed Offended that he tries to show that corrutpion is a natural tendency in Syria.This is what we can call the asadization of Syria.